Professors at San Francisco State University released a study titled "When an 'Educated' Black Man Becomes Lighter in the Mind’s Eye" on Tuesday exploring a concept they call "skin tone memory bias." 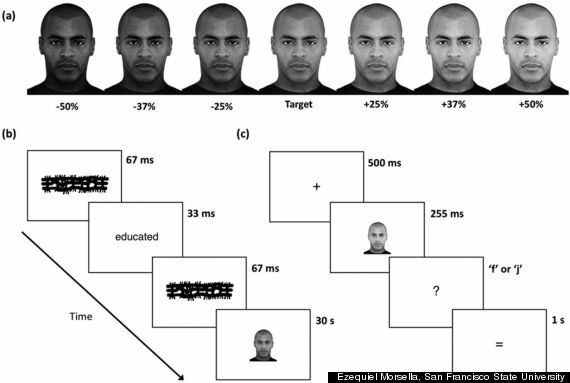 The results showed participants who were shown the word "educated" had more memory errors and often chose the photos with a lighter skin-tone when asked to recall the face they originally saw. The authors of the study explain this by stating that the findings are: "consistent with the mind’s striving for cognitive consistency or the tendency to attempt to resolve an incompatible cognition in the direction of a stereotype." "Phenotypic features associated with the social categorization of racial groups have been strongly linked to stereotyping, prejudice, and discrimination. Notably, individuals perceived to possess higher levels of Afrocentric features (e.g., dark skin, full lips, wide nose, coarse hair) have been subject to increased negative stereotyping (e.g., alleging heightened levels of aggression; see Blair, Chapleau, & Judd, 2005), leading to real-world repercussions, such as receiving longer prison sentences for crimes equated for severity and priors (Blair, Judd, & Chapleau, 2004; Viglione, Hannon, & DeFina, 2011)." The authors also found that this bias isn't isolated to the black community "it is pervasive across and within diverse ethnic and racial groups, including Whites, Latinos, and Blacks." To read the study, in full visit Sage Journal's site. CORRECTION: This article initially misquoted the researchers' concept as "skin tone bias," rather than "skin tone memory bias."